Regional theatres get their personalities from the regional talent that is drawn to perform beside the guest artists, resident company, visiting directors and designers. Jim Beck, a nurse in South Bend, has been in all but three or four productions over the last twelve years. He is now moving to Lake Wales, Florida. Yesterday was his last performance of Bye Bye Birdie. The following proclamation was presented to Jim following the curtain call. NOW THEREFORE, I, Richard L. Pletcher, producer of The Round Barn Theatre at Amish Acres in Nappanee, Indiana, do hereby proclaim today, July 23, 2006, as Jim Beck Day at Amish Acres and urge all patrons to join in this observance by showing appreciation for his dedication, talent, and friendship. In witness whereof, I have hereunto set my hand and caused this seal to be affixed. David Liverett has just published a wonderful new book, Light from the Barn: A collection of stories and art reflecting country life. 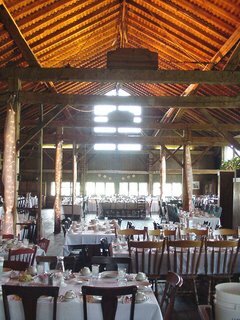 Barry L. Callen, editor of Anderson University Press, wrote the following essay to reflect on Liverett's ink drawing of The Round Barn Theatre at Amish Acres. He captures the essence of forty years of preserving and restoring Amish Acres and the mission that has guided its creation better than I have ever written. "Many barns today are little more than architectural antiques sitting here and there on the back roads of the American landscape. Housing developments and superhighways sprawl over former farmland, showing little respect for the agricultural life so common in the recent past. Barns do survive, of course, but too often they are pathetic looking, aged strugglers with neglect, animals long gone, paint peeling, the roof ready to collapse. They are pictures of pain. How good it is to find a rare link with the past that retains its pride and speaks gently and helpfully of a time largely gone, a time that can be of meaning to the time now here. One such link with American history sits on a farm in Northern Indiana that is on the National Register of Historic Places and draws thousands of tourists each year. The people who come to this rural retreat usually are intent on touching remnants of a simpler way of life that is now mostly absent from their experiences. Visits to Amish Acres typically involve entry into a round barn dating to 1911 and now dismantled, reconstructed, and converted into a state-of-the-art regional theatre that seats four hundred people at a time. Featured for the last two decades on the well-equipped stage in the barn is the production titled Plain and Fancy. A modern couple from the big city get stranded among the Amish. The clash of cultures is both entertaining and moving, a delightful experience that is also a pointed critique of the frantic pace and shoddy values of today’s urban existence. Twice I have sat through this production in the barn, hoping both times that the best of the past will be allowed to bring wisdom to the dilemmas of the present. Yesterday is gone and we should not be trapped in mere nostalgia. Even so, the newest is not necessarily the best. This one barn tries to be a living link, a cultural mixing place, a stage for the drama of passing time, a symbol of yesterday seeking to address tomorrow. Its prophetic plain words, however, will remain silent to fancy ears unless there is a will to hear and learn. Why not take a trip to the barn? Don’t look back as a way of running from the present. Look back for a while in order to be better prepared to look ahead with fresh inspiration and greater resolve to make a difference in your own time." After twenty years of producing Plain and Fancy musical theatre with some of the best young talent in the country selected from annual New York City auditions, some interesting relationships have developed. Recently Bob Cline (Plain and Fancy, 1995), who is now a casting director in NYC, was holding auditions for the upcoming national tour of Hairspray, Broadway's Tony Award winning musical of 2003. Tracy Funk (Plain and Fancy, 2003) was at the audition. Bob, seeing that she was an Amish Acres Round Barn Theatre (RBT) alumnus, asked if she knew Jerry O'Boyle (Plain and Fancy, 1994+). Jerry was artistic director of RBT for seven years. He has been out of professional theatre since 1999 but has kept his foot in the community theatre door while continuing to live in Nappanee. Bob was having trouble finding a suitable actor to play Edna Turnblad, the role for which Harvey Fierstein won the Tony for best actor...or was it best actress? 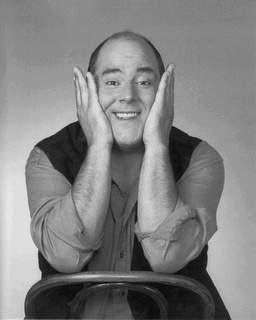 Having his number from Tracy, Bob called Jerry at his dispatcher's job and suggested he come to NYC and audition for the part. Jerry couldn't arrange a timely flight and went about his business. A week later Bob called back with urgency and implored Jerry to get on the next plane and bring his high heels. He was hired on the spot. The tour begins shortly in Atlantic City, New Jersey. The reason I know is because Bret Schrier (Sound of Music, 1998) who was directing Forever Plaid at the RBT at the time of Jerry's hiring, was called the next week to music direct and conduct the same tour. They arrive in Atlantic City Thursday and the run at Harrah's opens July 23 through September 8 before it hits the road. I've always heard musical theatre is a small world, I didn't know Nappanee was in the middle of it. How Do You Raise a Barn? "How Do You Raise a Barn?" is the opening scene and song in Plain and Fancy on The Round Barn Theatre stage at Amish Acres. Recently Linda Barr, a free lance writer from Westerville, Ohio, put the question to me. She had unsuccessfully sought first hand details. Here is what I told her: Historically, circa 1870: Farmer needs a barn. He hires a master barn builder. Farmer and master builder agree on the design of the barn. A 40’ x 80’ barn serves an 80 acre farm that is farmed by a single family using horse power. If the barn is a bank barn, meaning the second floor is entered through a mound or bank of dirt, the stables are in the lower level. Usually an overshoot protects the doors to the stables. The threshing floor, grainry, hay and straw mows are in the upper level. The builder would make a materials list. Logs would be cut from the nearby woods. White poplar being the most desirable because of its strength/weight factor and resistance to insects. All white poplar is gone in the Midwest, second growth yellow poplar is not as strong or resistant. The logs are dragged to the site by horses with sleds. They are cut to square dimensions, usually 8 to 10 inches square. Shorter supporting posts in the stables were 12 inches square. These are the posts, beams, joist, and perlins. A round log is made square by using an adz, an ax that you use like a hoe, thus the look of a hand hewn log. The foundation of the barn is laid up ahead of the barn raising using field stone and mortar. The method of connecting the posts and beams is using a mortise and tenon system. The mortise, or hole is made using a sitting drill press with a 2” bit. Four holes are drilled side by side with the corners and sides being squared using corner and flat chisels. The tenon is made by cutting away the sides of the beam and thus making a tounge 2 inches by 6 inches. The toung or tenon is inserted into the mortise and then a sharpened wooden peg is driven through a one inch drilled hole to hold it together. A 40x80 barn may have four bays using five bands. The bands are put together laying flat. They are raised in place by carpenters on one side lifting the band using pike poles, a long pole with a spike in the top. Carpenters on the other side us the same pike poles to keep the band from simply falling over. Once in place, temporary bracing is used to hold the band until a second is erected. The perlin is lifted to the top of the bands using ropes and pulleys, often pulled by horses. A wooden crane is built atop the band to give room for the leverage needed to lift the perlin in place. The perlins are notched every 18” using a single 2” hole squared with a chisel leaving a notch at the bottom to receive the rafter that is notched as well. A ridge pole, the length wise smaller beam that the rafters die into at the peak is installed using temporary supports as well. An entire barn can be built without the use of nails using this system. Neighbors show up by the 100’s to raise a barn. The master barn builder is simply supervising the volunteer labor through the process. The women are cooking for the noon day meal that refuels the workers. By this time portable saw mills were often used to rip the logs into square shapes. Because the saw trolly is limited in length, usually only posts, perhaps a maximum of 18’ were sawed, the longer beams and perlins and joist were hand hewn. At the end of the first day the barn is roofed and sided, only detailed inside work involving stables and stalls remains. That's how you raise a barn.